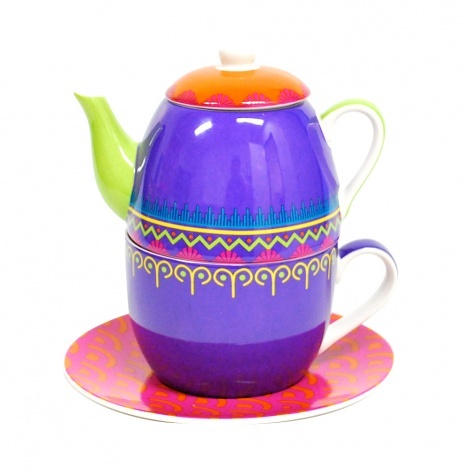 Say goodbye to drab tea parties where stale biscuits and daggy doilies are the norm; the vibrant Viva Fiesta Tea For One Set is the perfect blend of design and zing! The cup, pot and saucer set nest neatly together, adding that extra spark to your daily tea break. Boasting a summer fresh palette complemented by its glossy ceramic design, this set is essential for the fresh and fun tea party. Delve into the wonderful world of high tea, stylish morning coffees and towers of baked treats with the Tea Party Delights collection. Boasting vivacious designs that bring your table setting to life with floral fever, colour-blocking chic and quirky characters, the Tea Party Delights collection will turn every tea-time into a party worth remembering.